Ultima Thule: "The imperial ensign, which, full high advanced, Shone like a meteor, streaming to the wind"
"The imperial ensign, which, full high advanced, Shone like a meteor, streaming to the wind"
from the December 13th edition of The Christian Science Monitor . 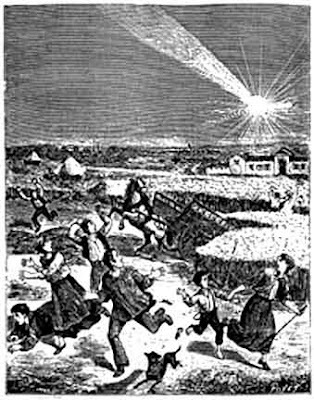 The top illustration is a rather fanciful depiction of the meteorite fall from a contemporaneous broadside; the bottom illustration is a photograph of the actual meteorite. 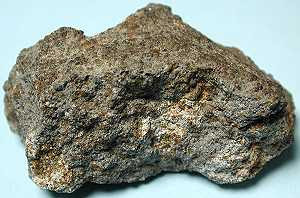 If you are interested in buying pieces of meteorites, I found a website for you: Michael Blood Meteorites. Meteors are rarely mentioned in poetry; my title is from Milton's Paradise Lost. Darkness clung to the early morning sky on Dec. 14, 1807, as Judge Nathan Wheeler started out on his morning constitutional along a country road near here. Suddenly the heavens exploded as a fireball raced across the horizon – whizzing sounds and three sonic booms cracked the quiet as rock rained down. Judge Wheeler ran back to his home, and, for a brief moment, thought Armageddon had arrived. At the same time, 30 miles down the road, Isaac Bronson, a former field surgeon in the American Revolution, dozed in a speeding stagecoach. Suddenly the cab rattled and shook, and the inside lit up like daylight. Nearby houses shuddered. Dr. Bronson urged the terrified driver to continue, even though he, too, feared the end of the world was nigh. He'd seen horrible things on the battlefield, but nothing had prepared him for this. Both learned men, Wheeler and Bronson were sought by journalists and scientists for testimony of the event. According to their accounts, the two were positively stumped about what had zoomed before their – and much of New England's – eyes. Though scientific understanding of what happened would not jell for decades, the awesome event is considered a scientific turning point: It was the first recorded meteorite fall in America. The bicentennial is being commemorated here Dec. 14. At 6 a.m., history buffs, space enthusiasts, and interested locals will gather with the historical societies of Weston and nearby Easton (the actual ground zero spot) to bury a time capsule containing the history of scientific knowledge gained since the sonic boom shook the towns. In this way a forgotten piece of history is being reintroduced to this bucolic town. A panel of scientists from the likes of MIT and Yale University – who are still parsing the significance of the Fall – is planned. Local students are writing essays on the scientific strides since the Fall; and throughout the year schools are incorporating meteor-themed science, math, and language arts in the curriculum. The way news of the Weston Fall ricocheted around the young nation offers telling – if quaint – hindsight, considering today's great scientific speculations about asteroids hitting the earth. Upon hearing of the Weston Fall, President Thomas Jefferson was rumored to have said: "I would more easily believe that two Yankee professors would lie than that stones would fall from heaven." Although no evidence exists that he uttered those words, "It typifies the thinking of the day," Dr. Binzel says. "It was the turn of the century and it was a turning point in understanding meteorites. Until then, meteorites were thought to be a weather phenomenon. Another name for them was actually thunder stones." Indeed, most people scoffed at the notion that meteorites came from outer space – a belief not far removed from those held as long as three centuries earlier in Europe. Accounts from 1492 detail a meteorite falling on Eisenheim, Germany. Locals hauled it into a church where they kept it chained, lest it fly away. "I can't stop thinking about Chicken Little," says Judy Albin, a trustee of the Weston Historical Society and co-chair of the meteorite committee. "The sky was falling; it must have been an absolutely amazing, incredible, frightening thing." Certainly Mrs. Gardner of Wrentham, Mass. was concerned over the Weston Fall. Heeding Benjamin Franklin's advice, she rose before sun-up to log her daily weather observation. Peering out her window, she saw a fiery orb race through the sky. The sphere, which looked about half the size of the full moon to her, was traveling south between 40,000 and 50,000 m.p.h. before it entered the atmosphere. She wondered, according to her account in a local newspaper, "Where was the moon going to?" "The grains, the seeds, of the solar system are inside meteorites," says Dr. Karl Turekian, a Peabody curator and professor of geology and geophysics at Yale. "Weston retains some of these seeds and so that's important. If we didn't have meteorites we wouldn't know what the Earth was made of or how old it is." While the meteorite's importance wasn't fully understood in 1807, certainly many divined a significance in the event and the debris it left. When farmer Elijah Seeley went to check on his cattle he found them in a neighboring pasture. The terrified bovines had jumped a wall. Seeley called his wife, and they began carting away pieces of the still warm meteorite. These black-crusted stones differed from the usual crop of rocks otherwise known as New England potatoes. Upon reaching Weston that cold morning, Bronson sent word to Yale about the otherworldly event. The university dispatched Benjamin Silliman and James Kingsley to interview witnesses. When they interviewed Wheeler they decided that because he wasn't "influenced by fear or imagination" his word could be trusted. But when they visited the home of William Prince, they were just plain disgusted. Clearly the Prince family (no relation to this reporter) didn't believe the early bird caught the worm. They barely noticed the explosions, according to Silliman's 1807 report published in The Connecticut Herald. "Not even a fresh hole made through the turf ... about twenty-five feet from the house, led to any conception of the cause, or induce any other enquiry than why a new post hole should have been dug where there was no use for it," according to Silliman's. When the Princes finally checked the hole, they found a "noble specimen," wrote Silliman. Aside from interviews, Silliman collected as many stones as possible to study. And a tug of war erupted between locals and the Yale professors for pieces of the meteorite. But today Yale, Weston, and Easton are cooperating quite nicely – without the help of a planetary Dr. Phil to celebrate this little big bang. Copyright © 2007 The Christian Science Monitor. All rights reserved. I really appreciate your opinion about this topic. Looking forward for more useful info soon.